Something beautiful happens when our loved ones inspire us to follow our dreams. That’s what happened for Kelly Williams, who has turned her love for furniture, history, romance and all things vintage into a family owned and operated business — A Bushel and a Peck Vintage Rentals. The Williams family. Photo by Angela Stott Photography. Brides, event planners and photographers are among the countless clients who turn to Kelly’s expansive inventory of charming antique, vintage and repurposed pieces to add a more personal touch to life’s most important occasions. If you need something unique for a special project, Kelly and her family offer upholstered seating, architectural details, reclaimed barn wood furniture, china, small details and so much more. They’ll even help you style their pieces with your other details or create something custom for you. What’s old is new again when you turn to A Bushel and a Peck, and it’s not just a business. For Kelly, her husband, Phil, and her daughter, Lily, it’s a way of life. A vintage rental service just made sense for Kelly, who has always had a passion for celebrating history and bringing old beauty back to life. She and Phil developed the idea for their business after successfully creating their own vintage-inspired wedding, and they started working to make it happen back in the winter season of 2013-2014. 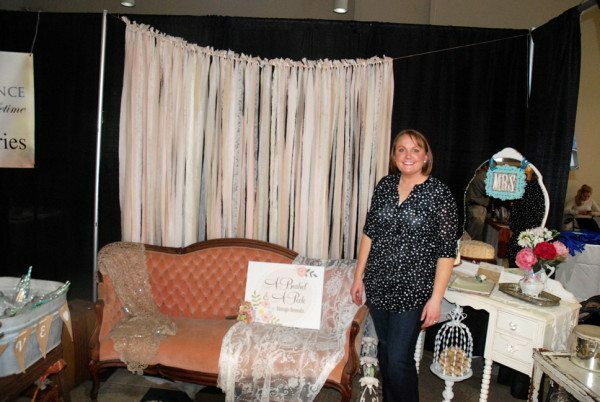 Kelly Williams is pictured representing A Bushel and a Peck at last year’s High South Weddings Expo in Boone. Photo by Ken Ketchie. The duo consulted with local vendors to see if a need existed for the services they hoped to provide, and quickly started working to collect inventory when they received a positive response. Choosing a name for their business was a no-brainer, thanks to Kelly’s precious memories of her childhood and family. “I remember my mom singing the song ‘A Bushel and a Peck’ to me when I was young, as well as my Grandma. As a new mother, I started singing it to my daughter,” she said. “When I went to choose a name I had a list, and the one that I kept going back to was ‘A Bushel and a Peck.’ I remember it from growing up, and it was one of the first songs my daughter sang with me. Before they knew it, the Williams team had amassed an impressive collection of interesting pieces, each one surprising and alluring in its own way. A styled photo shoot for High South Weddings magazine features reclaimed barn wood furniture, a candelabra and other details provided by A Bushel and a Peck. Photo by Calah Stephens Photography. Today, many brides and couples each year rent pieces from the collection to add a little something special to their weddings. Kelly and Phil also work with photographers, consultants and other project leaders to style and coordinate soirées in the High Country and the foothills. They’ll even create custom details for you, like party favors or décor pieces, which fit your individualized needs. “A Bushel and a Peck Vintage Rentals is committed to exceeding the expectations of clients, vendors and photographers by providing one-of-a-kind rentals, styling, custom items and services with extraordinary customer service and sincere thoughtfulness to each event, wedding and photography session,” Kelly said. If you have your eye on something in their inventory, they’ll make time to show you every option, offer creative ideas and make sure you get exactly what you want. “Some brides are very hands-on and interested in knowing all about the items, and some see our inventory styled for other set-ups and they know that’s exactly what they want,” said Kelly. “I will chat with them by phone, email or messaging, and I also send over a questionnaire to gather some more information so I can assist them to the best of my abilities. Kelly works to offer pieces tell their own stories, and she’s always interested in learning the history behind each and every one. “I want my business to be a reflection of me. I am not squeaky clean, but I like nice things. I like rusty ‘junk,’ but I also want tufts,” she said. “I love everything antique, eclectic, old, reclaimed and vintage, and I want people to know — that’s who I am and that’s what I bring to weddings, events and photography. Her passion for each piece may be an important aspect of Kelly’s identity as an entrepreneur, but that still comes in second to the experience she provides for her clients, who almost always become her friends. A Bushel and a Peck is a family business through and through, and each part of the Williams clan plays an important part in its success. “My family plays a huge role, literally and figuratively. We are a small business and we are a part of every single event, wedding or photo shoot,” said Kelly. “I like to think of myself as the brains of the operation — the purveyor, picker, stylist, email answerer, problem solver and creator. 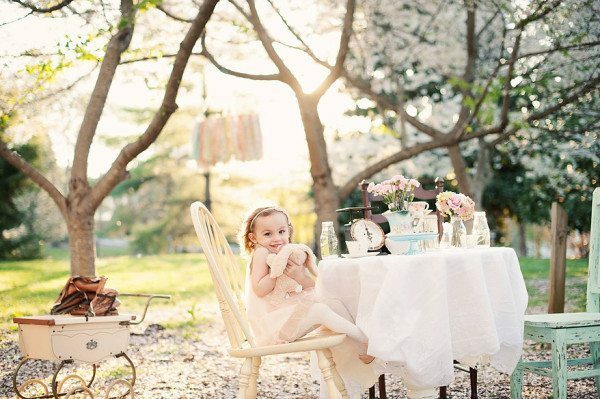 Kelly and Phil’s daughter, Lily, is pictured in an outdoor set-up styled by A Bushel and a Peck. Photo by Nicole Holman Photography. The littlest crewmember may be small, but she’s mighty when it comes to encouraging, energizing and uplifting her parents. After all, she’s the reason they work as hard as they do. “My, oh, my. My sweet little angel, Lily, inspires me every second of every day. I can honestly say that I would not be doing this if it weren’t for her,” Kelly said. “I want her to see her mother doing something that she loves, is passionate about and is proud to do. What is so amazing is that she loves it so much, too. After several years of successful operation in the High Country and beyond, the Williams family continues to grow their business, expand their inventory and tackle new adventures. Most recently, they invested in a comprehensive new website that shows off most of the pieces they have to offer and explains their services in one easy-to-access, fun-to-explore location. New and return customers are now just one click away from taking a virtual tour of every detail that the Williams team has to offer. Guests can learn more about who they are as a family, why they love what they do and how they can help make any special occasion even better. A Bushel and a Peck Vintage Rentals is a member of the High South Event Professionals network — a community of like-minded industry pros who work together to promote the mountains of western North Carolina, eastern Tennessee and southwestern Virginia as the premier special events destination in the Southeast. Meet the Williams crew and other preferred local vendors at the High South Wedding Expo at the Boone Mall on Sunday, March 20. Looking to add one or more remarkable vintage pieces to your next special occasion? Give Kelly a call at 828-773-0354, check out their brand new website or find A Bushel and a Peck on Facebook.